Denver Public Works crews began installing a protected bike lane on West 14th Avenue this week, the first new protected bikeway of 2017. It should be ready to ride by next week. The bikeway, which replaces a standard, striped bike lane, will run for a half-mile between Speer Boulevard and Bannock Street — or about 500 feet past Bannock to be exact. That extra bit is great if you’re heading to the museums or the library there, but if you’re riding any further up 14th, get ready to be tossed back into general traffic when the lane abruptly ends. Parked cars, plastic posts, and tan paint will buffer people on bikes from drivers on the one-way, two-lane street. 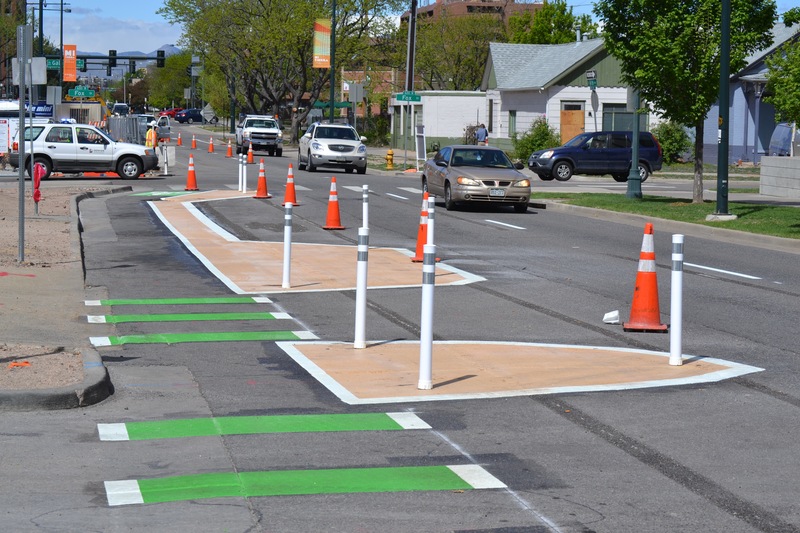 Some intersections will have a painted stop bar for bicyclists ahead of the stop bar for cars, so riders will be more visible to drivers who might otherwise turn into them. The lane also has green markings at driveways and intersections to warn drivers to look for people riding. In addition to the welcome physical protection, the project should calm traffic by visually narrowing the street for drivers. DPW will install a safer connection for bicyclists coming off the Cherry Creek Trail as well. The new bikeway really begins west of Speer Boulevard, with a turn box to help cyclists enter traffic. Tan paint and white plastic bollards will separate bike traffic from cars at the island between Speer and Galapago Street, while giving pedestrians more room to stand and walk — not unlike the intersection of 17th and Wynkoop. 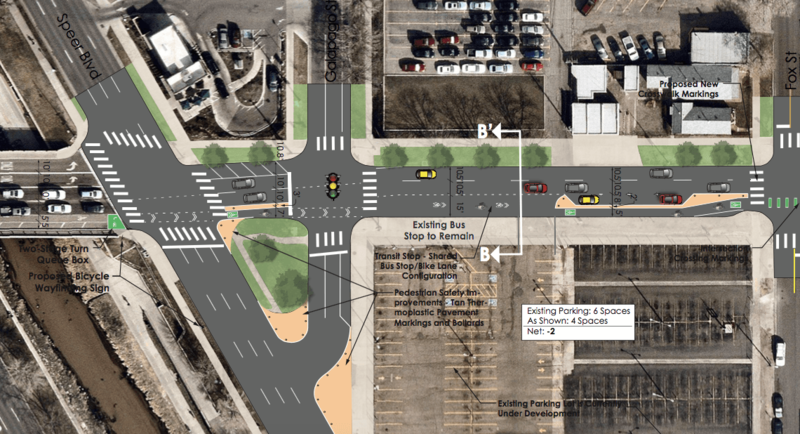 For a more in-depth look at the bikeway, check out Streetsblog’s coverage of the final design from last summer.